Welcome to Day 2! We’re playing 2 more Rounds of Swiss before cutting to the Top 32 where we enter the Single Elimination playoff! 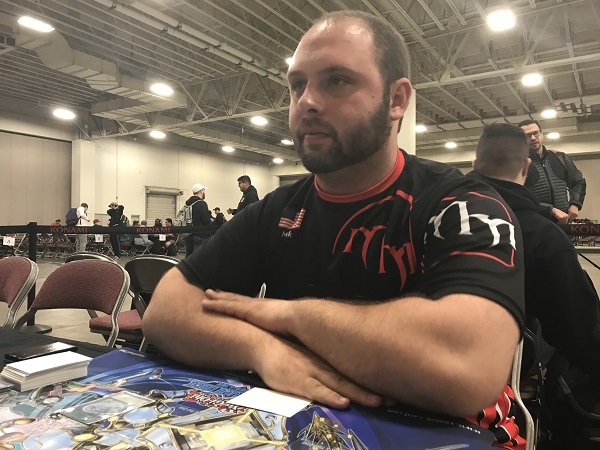 Michael Zimmitti from Connecticut has a record of 6-1-1 with his Mekk-Knight Invoked Deck. His opponent is Kenny Nguyen from California. He has a 6-2 record with his True Draco Deck. Every Match from here on out is important and no one can afford to take a loss. It’s time to Duel! Nguyen won the roll and elected to go first. He started off with Pot of Desires, banishing the top 10 cards from his Deck to draw 2 cards. He then activated Dragonic Diagram, Set 2 cards to the back row, then activated Dragonic Diagram to destroy the Set Terraforming to add True Draco Apocalypse from his Deck to his hand. He Set 2 more to the back and passed. Zimmitti started with a hand of Magical Meltdown, Mekk-Knight Red Moon, Mekk-Knight Indigo Eclipse, 2 copies of Mekk-Knight Blue Sky and Aleister the Invoker. Nguyen activated Anti-Spell Fragrance in Zimmitti’s Standby Phase. In the Main Phase, Zimmitti Normal Summoned Aleister and used its effect to add Invocation from Deck to hand. He Set Invocation across from a face-down card and then Special Summoned Mekk-Knight Indigo Eclipse to that column. He used the effect of Mekk-Knight Indigo Eclipse to move it one column to the right then Special Summoned Mekk-Knight Blue Sky to the newly vacated column. He used its effect to add Mekk-Knight Purple Nightmare from Deck to hand. Before going into the Battle Phase, Nguyen activated the Set True Draco Apocalypse and used the effect to Tribute it to Tribute Summon Majesty Maiden, the True Dracocaster. True Draco Apocalypse’s Graveyard effect destroyed Mekk-Knight Indigo Eclipse. Zimmitti continued by using the remaining 2 monsters to Link Summon Underclock Taker. He then Special Summoned Mekk-Knight Purple Nightmare behind Underclock Taker! In the Battle Phase, Mekk-Knight Purple Nightmare attacked Majesty Maiden, the True Dracocaster and during the Battle Step, Zimmitti activated Mekk-Knight Purple Nightmare’s effect and Nguyen chained Majesty Maiden, the True Dracocaster’s effect. 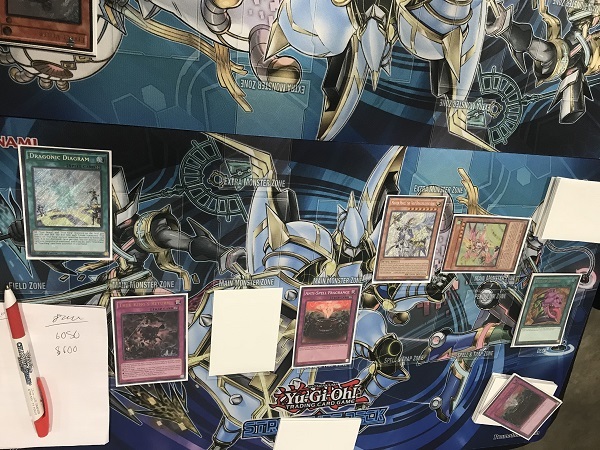 Nguyen added Master Peace, the True Dracoslaying King from his Deck to his hand while Zimmitti banished Purple to add Mekk-Knight Blue Sky from his Deck to his hand. In Main Phase 2, Zimmitti Set Magical Meltdown and passed. Nguyen activated Dragonic Diagram’s effect, destroying the Set Pot of Desires (across from Underclock Taker) to add Disciples of the True Dracophoenix from his Deck to his hand. He Set a Spell/Trap then Tributed the Set Disciples of the True Dracophoenix and Majesty Maiden, the True Dracocaster to Tribute Summon Master Peace, the True Dracoslaying King. Master Peace attacked and destroyed Zimmitti’s Underclock Taker by battle. In Main Phase 2, Master Peace, the True Dracoslaying King’s effect destroyed Zimmitti’s Set Magical Meltdown. Zimmitti drew Instant Fusion for turn. He returned Mekk-Knight Purple Nightmare back to his field in the middle Main Monster Zone. He Set Instant Fusion in his second Spell/Trap Zone then Special Summoned Mekk-Knight Blue Sky in that column in Defense Position. He passed here. Nguyen used the effect of Dragonic Diagram, destroying an Anti-Spell Fragrance from his hand to add True King’s Return from his Deck to his hand. Master Peace, the True Dracoslaying King destroyed Zimmitti’s Mekk-Knight Purple Nightmare by battle, leaving him at 5600 LP. Nguyen then used Master Peace, the True Dracoslaying King’s effect, banishing Anti-Spell Fragrance from his Graveyard to destroy Zimmitti’s Set Instant Fusion. Zimmitti drew Effect Veiler for turn. He Set it and passed. In the End Phase, Nguyen activated True King’s Return, Special Summoning Majesty Maiden, the True Dracocaster from the Graveyard in Defense Position. Nguyen used both of his True Dracos to destroy Zimmitti’s monster by battle. In Main Phase 2, he activated Dragonic Diagram, destroying Majesty Maiden, the True Dracocaster to add a second Master Peace, the True Dracoslaying King from his Deck to his hand. In the End Phase, he used True King’s Return to bring back Majesty Maiden, the True Dracocaster again. Zimmitti drew Terraforming which was useless against Nguyen’s Anti-Spell Fragrance. Zimmitti conceded the game here. Zimmitti elected for Nguyen to go first. Nguyen started off with 2 Set backrow and passed. Zimmitti started off with a hand of Invocation, Raigeki, 2 copies of Scapegoat, Ash Blossom & Joyous Spring and Mekk-Knight Indigo Eclipse. He Set one of the Scapegoats and Special Summoned Mekk-Knight Indigo Eclipse to that column. It attacked for 2400, leaving Nguyen at 5600 LP. In Main Phase 2, he Set the second Scapegoat and passed. 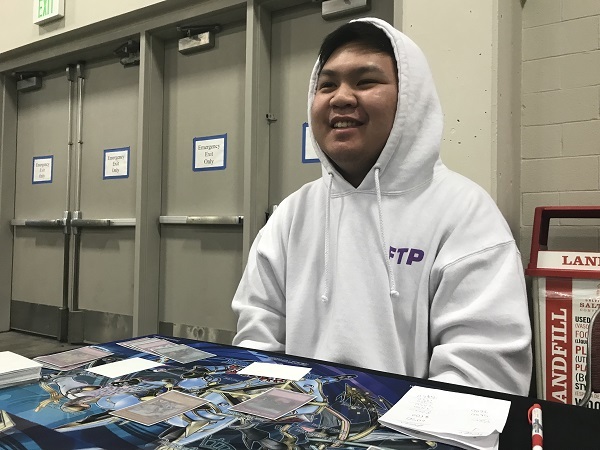 Nguyen Set a third Spell/Trap, then Tributed it – Disciples of the True Dracophoenix – and a Set Skill Drain for Master Peace, the True Dracoslaying King. 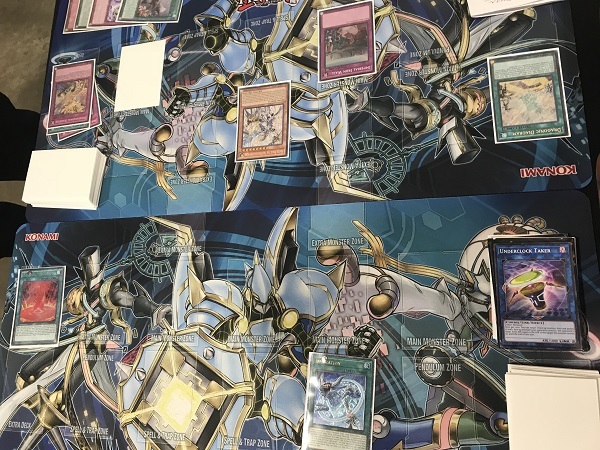 The Disciples of the True Dracophoenix sent to the Graveyard activated its effect, targeting Zimmitti’s Set Scapegoat which was Chained; but Nguyen negated it with his final Set card, Solemn Warning! Master Peace, the True Dracoslaying King attacked and destroyed Zimmitti’s Mekk-Knight Indigo Eclipse. In Main Phase 2, he Set a card to the back and activated Card of Demise; but Zimmitti negated it with Ash Blossom & Joyous Spring! In the End Phase, Zimmitti activated Scapegoat, giving himself 4 Sheep Tokens! Zimmitti drew a second Invocation, useless without a way to get to an Aleister the Invoker. He used one Sheep Token to Link Summon Linkuriboh! He then used 2 more Tokens to Link Summon Proxy Dragon. Nguyen activated Master Peace, the True Dracoslaying King’s effect, banishing Skill Drain to destroy Proxy Dragon. Nguyen drew to 1 card in hand, having a Master Peace, the True Dracoslaying King and a Set Spell/Trap on the field. He used Master Peace, the True Dracoslaying King’s effect, banishing Disciples of the True Dracophoenix to destroy Linkuriboh, and in the Battle Phase, Master Peace, the True Dracoslaying King attacked into the last Sheep Token but Zimmitti used Linkuriboh’s effect to Tribute the Token to bring Linkuriboh back from the Graveyard. Zimmitti drew the third Scapegoat in his Deck. He Set 3 cards, leaving one copy of Invocation in his hand and passed. Nguyen Set a Spell/Trap then activated Dragonic Diagram. He used the effect, destroying the newly Set True Draco Apocalypse and adding True Draco Heritage from his Deck to his hand. Nguyen used True Draco Apocalypse’s effect to destroy Zimmitti’s Linkuriboh. Nguyen then activated True Draco Heritage and used its effect to draw a card. Master Peace, the True Dracoslaying King attacked directly, leaving him at 4500 LP. Nguyen Set another Spell/Trap in Main Phase 2. In the End Phase, Zimmitti activated Scapegoat, giving him another 4 Sheep Tokens. Zimmitti drew Magical Meltdown. Things might start looking up from here. Zimmitti used two Tokens to Link Summon Missus Radiant. He used another Token for Link Spider, then used Linkuriboh’s effect, Tributing the last Sheep Token to Special Summon it from the Graveyard. Nguyen used Master Peace, the True Dracoslaying King’s effect, banishing True Draco Apocalypse to destroy Missus Radiant. Zimmitti then activated Magical Meltdown to add Aleister the Invoker from his Deck to his hand, then it was Normal Summoned. Zimmitti elected not to use its effect. Zimmitti used Aleister the Invoker and Link Spider to Link Summon Underclock Taker. He then activated his Set Invocation, but Nguyen Chained Dimensional Barrier declaring Fusion! Invocation resolved without effect, leaving Aleister the Invoker in the Graveyard where Invocation’s Graveyard effect couldn’t bring it back to Zimmitti’s hand. Nguyen used Dragonic Diagram’s effect, destroying the face-up True Draco Heritage to add Master Peace, the True Dracoslaying King from his Deck to his hand. Heritage’s effect destroyed Zimmitti’s Set Raigeki. Master Peace, the True Dracoslaying King’s effect banished Heritage to destroy Linkuriboh, then Master Peace destroyed Underclock Taker by battle, leaving Zimmitti at 2550 LP. Nguyen Set a Spell/Trap and passed. Zimmitti drew Monster Reborn! He activated Invocation, but Nguyen Chained Imperial Iron Wall! With no plays left to make that could reverse the situation, Zimmitti extended the handshake! Kenny Nguyen improves his record to 7-2! Round 9 Feature Match: Dakota Angeloff vs. Jeremy Cummins YCS Salt Lake City: Round 9 Pairings!